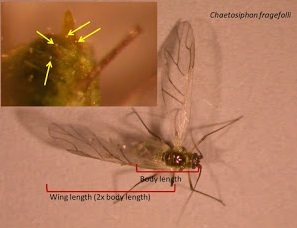 In this week's aphid trapping and monitoring we found our first winged strawberry aphids. This aphid species is the primary vector of the strawberry viruses (strawberry mild yellow edge virus and strawberry mottle virus) found in Nova Scotia. During the strawberry aphid flight period strawberry fields are at their highest risk of becoming infected with viruses, as winged strawberry aphids can travel long distances carrying viruses to previously uninfected fields. Because of this it is crucial to continue to monitor and scout for winged and wingless strawberry aphids in your fields. It is also important to continue to manage for strawberry aphids during this period. Since we are in the middle of harvest there are limited products available for fruiting fields but there are a few tools with short (0 day or 1 day) pre-harvest intervals. For information on control options please see Perennia's Strawberry Management Guide 2018.